Well off to a great week...a quiet one! The kids are content and we are too. That makes it a nice environment around here....very peaceful! I love to hear the joy in everyone's voices and see it in the faces. The girls and I played a new video game most all day Sunday, Jak and Daxter. That was fun! Jim helped us past the touch spots! We played Life last nite. It was the girls' first time playing. They said they remember playing with the parts and pieces of it when they were very small and said they always wanted to play it, so we did! Adrienne won with over $2 million! She was a trooper and held out the entire game and kept asking why I was grinning most of the game? !--I told her it was because I was excited to play the game with them and very happy and content! She grinned back and said oohhh! I just love my girls! They are the greatest thing that ever happened to me! Adrienne has been busy working on furry paws and has her elite account up and busy! She has learned to make manips, an altered pic, for players on the site to post of their dogs or whatever. She has showed Ashley how to run the new program she found called Gimp! So now Ashley can make the manips too! They are having a blast making them for everything! 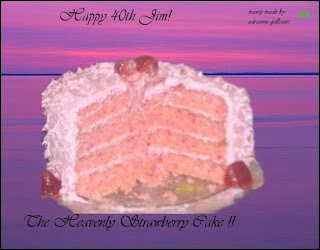 They even did one for Jim's cake we made him on Saturday for his birthday! BTW, this was Ashley's (and mine) first time making a 4-layer cake! This is the biggest we have ever made! It was soo much fun to put together and frost and decorate that Ashley mentioned becoming a cake decorator while doing it! I told her it would be a fun practice for sure! !